Sterling tumbled broadly as the UK opened a new chapter in Brexit negotiation with yesterday’s parliamentary amendment votes. In short, Prime Minister Theresa May needs to go back to EU to renegotiate the Irish backstop into alternative arrangements. But EU has repeated its stance on no renegotiation. For now it’s uncertain whether there could be on standoff on the issue. But so far, losses in the Pound are relatively limited as it stabilized in Asian markets. At this point, Australian Dollar is the strongest one for today, as lifted by stronger than expected consumer inflation reading. New Zealand Dollar follows as the second. Canadian Dollar is also firm as oil prices rebound due to US sanctions on Venezuela. Swiss Franc, Yen and Dollar are the weakest ones. The greenback will look into today’s FOMC statement and press conference. Traders will also keep an eye on US-China trade talks, as high level meeting between Chinese Vice Premier Liu He and US Trade Representative Robert Lighthizer starts today in Washington. 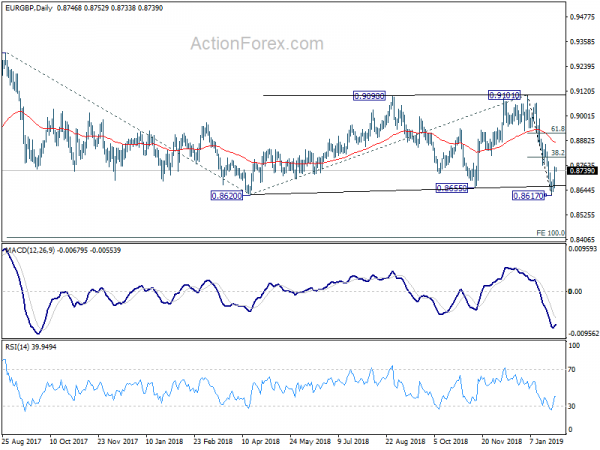 Technically, EUR/GBP’s rebound tentatively suggests that 0.8620 key support is defended. Break of 1.3012 in GBP/USD will further indicate near term topping in the Pound. With today’s rebound, AUD/USD is now looking at 0.7235 resistance and break will confirm resumption of recent rebound from 0.6722 low. In other markets, Nikkei is currently down -0.29%. Hong Kong HSI is up 0.24%. China Shanghai SSE is down -0.01%. Singapore Strait Times is down -0.18%. Japan 10-year JGB yield is up 0.0033 at 0.007. Overnight, DOW rose 0.21%. S&P 500 dropped -0.15%. NASDAQ dropped -0.81%. 10-year yield dropped -0.032 to 2.712. Sterling dropped broadly after the Parliament voted 317 to 301 for Conservative MP Graham Brady’s Brexit deal amendment. Prime Minister Theresa is now required to go back to EU to renegotiate the deal to replace the Irish backstop with “alternative arrangements”. At the same time, the Parliament rejected Labour MP Yvette Cooper’s proposal to force Article 50 extension to avoid no-deal Brexit. Though, the symbolic amendments opposing no-deal Brexit was passed. However, EU repeated its stance that there will be no renegotiation. And, it’s uncertain what exactly alternative arrangements on the Irish border backstop are. Australian Dollar is lifted slightly by stronger than expected consumer inflation reading. Headline CPI rose 0.5% qoq in Q4 versus expectation of 0.4% qoq. Annual rate slowed to 1.8% yoy, down from 1.9% yoy, but beat expectation of 1.7% yoy. RBA trimmed mean CPI rose 0.4% qoq, 1.8% yoy, matched expectations. RBA weighed media CPI rose 0.4% qoq, 1.7% yoy, basically matched expectations. ABS also noted that the most significant price rises this quarter are tobacco (+9.4%), domestic holiday travel and accommodation (+6.2%), fruit (+5.0%) and new dwelling purchase by owner-occupiers (+0.4%). The most significant price falls this quarter are automotive fuel (-2.5%), audio visual and computing equipment (-3.3%), wine (-1.9%), and telecommunications equipment and services (-1.5%). The economic calendar is rather busy today. French GDP, Swiss KOF, Eurozone confidence indicators, Germany CPI and US ADP employment will also be watched. But the major focus will be on FOMC rate decision and press conference. What Jerome Powell Will Say? EUR/GBP’s strong rebound and break of 0.8725 minor resistance suggests short term bottoming, after defending 0.8620 key support. 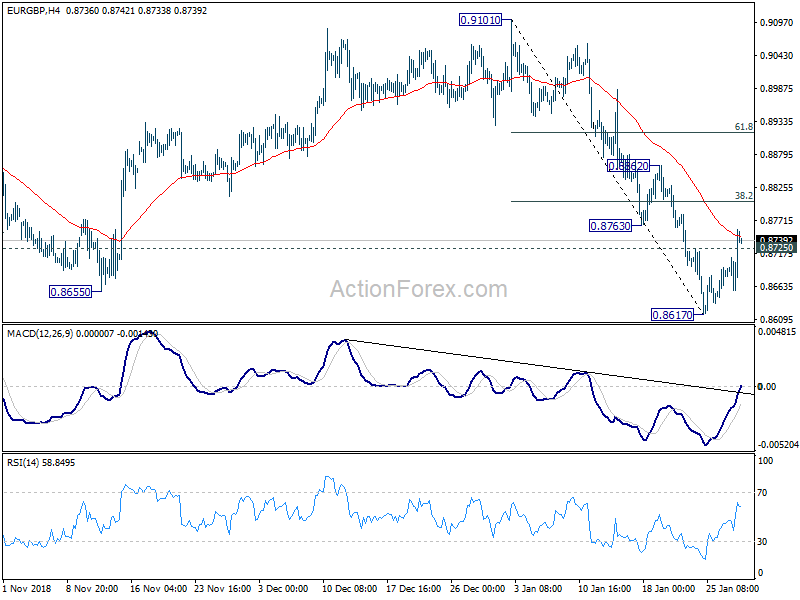 Intraday bias is turned back to the upside for 38.2% retracement of 0.9101 to 0.8617 at 0.8802. 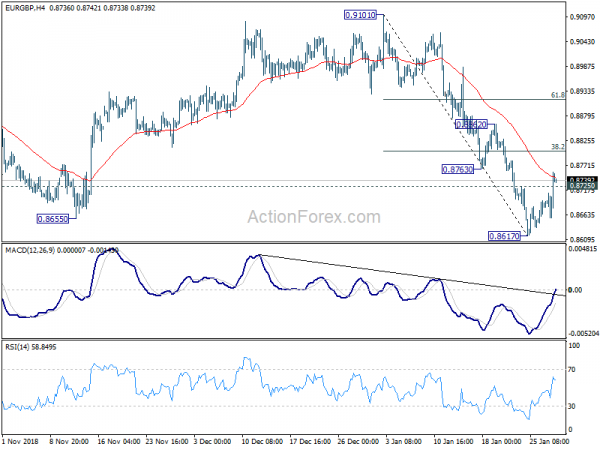 Break will target 61.8% retracement at 0.8916. On the downside, decisive break of 0.8620 will resume larger decline from 0.9305 and target 100% projection of 0.9305 to 0.8620 from 0.9101 at 0.8416.